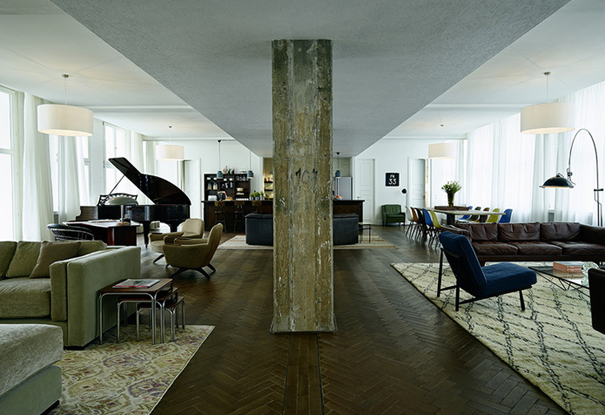 It’s long been our favored hotel in the German capital, Soho House that occupies a fringe Mitte location within a 1920s department store high-rise now outfitted with rooftop pool, clubhouse and series of lofty-style rooms and apartments. Now come their new Lofts that cater to a more exclusive clientele of celebrities and VIPs that are looking for larger residence-style spaces with private elevators that removed them from the main house fray. Available for short and long-term stays, loft residents arrive to stunning spaces of herringbone oak floors, floor-to-ceiling windows and open-plan living framed in leather-clad sofas and foosball tables. A mid-century leaning décor accents raw concrete elements of the original structure with imported Moroccan rugs and step-out balconies. Bedrooms infuse a bit more eatery color with bathrooms adorned in a signature style of white tile and chunky fixtures indicative of Soho House properties to date. Each of the four lofts come with a fully equipped kitchen and bar as well as a DJ table for those that can get Calvin Harris to fly in on a whim. Additionally amenities like a dedicated concierge, on-call bartender and even a chef for those looking to entertain on a larger, grander scale.